This low-priced but very effective cream is excellent for teenagers. It purifies the skin and controls breakouts. Pregnant women may use this product safely as it contains no vitamin A. It is also wonderful to treat clogged pores. Use as a mask and follow by the Mild Scrub to help lift the sebum out of the pores. The Cleansing Milk also works well with this product. This natural emulsion helps normalize the secretion of the sebum and maintains a balance of the hydro-lipid film. It tones, cleanses and gives fresh, radiant skin in an instant. Containing 2% Oxygen to really detox and fight the bacteria that causes spots, oxygen face cream is a gentle but advanced skin regulator. that it re-regulates skin which deviates from the norm during adolescence. Apply only to skin that is thoroughly cleansed. Ideal for acne sufferers, this product is an important step in the Karin Herzog Acne Program. Used all over the facial area as a morning and night cream, with Vita-A-Kombi 3 cream used as a specific spot treatment. 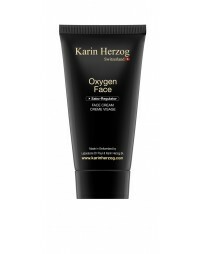 After trialling a sample of the VAK1% at first, I decided I'd give Karin Herzog a go, using the oxygen face cream as recommended for my age/skin type (27/some breakouts). This is such a wonderful light cream, but hydrates really well without being oily. After 2 & 1/2 months of using it, my skin looks so much clearer, soft and fresh. 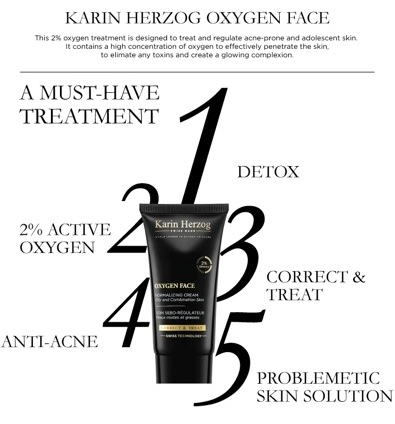 I can't recommend Karin Herzog products enough!! I use this product specifically and only--when my face is extra oily; For a few days I use this product instead of my routine KH Kombi. This practice is perfect for me (Fem. in my 50s). Great product. I have been using Karin Herzog products for 10 years. I always try out new products but end up going back to Karin Herzog. Great for acne and balancing out my skin. If I start to break out I just spot treat with the Oxygen cream and with in 2 days I see a huge improvement. IngredientsAqua, Paraffinum Liquidum, Glycerin, Stearyl Alcohol, Polysorbate 20, Hydrogen Peroxide, Thiamine Nitrate.